The law is in place. The period of grace has expired. You may be prosecuted if you smoke anywhere that is not a designated smoking area which conforms to the law. The "Public" is the watchdog, and it is determined and aggressive. I can vouch for this from my experience on a recent TV Panel supposedly assembled to discuss the implications of this new law. "Discussion" hardly came into it. If this all sounds drastic and even threatening - it is. News items about prosecutions and convictions have already appeared in the papers, and more will no doubt follow. We need to heed these warning signals and show that smokers are law-abiding citizens who want to enjoy a smoke, with their rights respected too. Fortunately there are establishments that have made the effort to comply with the law, and have created smoking areas. These establishments deserve our support, and we should give it to them. We are often asked "Where are these establishments?" "Where can we smoke?" We know of some, and we are starting a list on our website. We would like this list to be as comprehensive as possible, so if you have had a good experience at a restaurant, pub, coffee bar, or wherever, let us know the name and telephone number. We'll make contact and confirm that the establishment does comply with the law and would like to be listed. Together we can compile a nation-wide list of sympathetic venues in which you can enjoy your smoke after a meal, or with a drink or a cup of coffee, and not feel threatened. Sometimes, especially in a smaller establishment, you may prefer not to take out a big cigar or your pipe. Try one of the smaller blended cigars - very smooth and gentle. From August 2 we feature a Swiss Villiger Twinpack: No 1 and No 3 - R125.00. 5 Panatellas and 5 Slim Coronas - foil wrapped for freshness. Look at all the new options for choosing a cigar "Inside the Humidor". Pipes - what's in a good brand name? point from a given manufacturer has had the same basic treatment as the top-of-the-range. a "vague" grain or obvious surface flaws. Punto Oro Fumée - one of the most beautiful pipes we know. **The "Grezze" virgin finish is featured from August 16 to August 29 at R140.00; or R170.00 for a polished finish. "Bloom" or "Plume" (an extruded oil substance on a cigar) is the obvious result of a chemical reaction going on in a dark, moist atmosphere such as inside your humidor, causing the oils in the cigar leaf to come to the surface. This fine whitish dust does no harm to the cigars. On the contrary it indicates that the cigar is ageing nicely and may improve in taste. There is no need for alarm - it is both tasteless and odourless. For the sake of appearance the bloom can easily be removed with a soft cloth, tissue or baby brush. "Mould" or "Mold" depending on whether you use the English or American spelling, is a signal for action. It is evidence that the cigars are being stored in conditions that are too damp and/or too hot. Mould is distinguishable from Bloom by its bluish tint, musty aroma, and (if you smoke them) the mouldy taste. You'll recognise the "damp cellar" smell. If you try to brush it off, it leaves marks on the wrapper. The best action is to separate and remove all the cigars from the humidor. This will allow the humidor to aerate and dry out. You can even wipe the inside with a dry cloth. Once it is clean and dry (check the smell) you may replace the unaffected cigars. You may be able to rehabilitate and save the mouldy cigars but if not, discard them. Do not put them in with the clean cigars. They can have a seriously detrimental affect on them, ruining your smoking enjoyment. 1. It could be residue of chemical dust (like the "fur" in a kettle) after the evaporation of the water you have been using to create humidity. You could use distilled (or boiled) water which would contain less salts. See "Humidification". 2. Or it could be disintegration of the "oasis" material in your humidifier. It may be necessary to replace it with fresh "oasis" obtainable from a florist. In either case remove the dust regularly or it might affect the taste of the cigar. No, we are not going to offer you cigars covered with bloom next week - nor even a baby brush at a special price. Instead we are offering you the opportunity to try one of the newer Cuban brands - Vegas Robaina - in 3 sizes. Launched in Spain in 1997. Filler comes from San Luis region in famed Vuelta Abajo. Wrapper comes from the famous Vega Robaina (after which the brand is named). These wrappers were previously used exclusively for the Cohiba brand. Produced in the Jose Marti (H Upmann) factory. The cigars are ideal for aging. Now that the restrictive Anti-smoking laws are in place, smokers are often "invited" to smoke outdoors. Occasionally you may choose to smoke outdoors, as we did when a group of cigar enthusiasts visited a Game Lodge. We sat on the deck with our cigars and watched the Waterhole parade. Marvellous! The game drives were non-smoking - but a short leg-stretching, smoke break was included. Whatever the circumstances that lead to smoking outdoors here are a few cautionary comments that may prevent you from spoiling the experience. As with cigars the elements can play havoc with your normal smoking pattern. A breeze across the top of the bowl will accelerate the burning rate of your tobacco, affecting the taste, and may generate so much heat that the bowl becomes too hot to handle. An uneven burn can cause a "burnout" from the inside of the bowl. The answer is to use a thick wooded pipe and a slow burning tobacco. Try to smoke with the breeze behind you, and smoke gently. A pre-filled, half or one-third bowl might be most welcome for a short break. This may not be easy. Seek cover and use cigar matches (try two together), or an Imco gas lighter with its angled flame. Outdoor "liquid fuel" lighters are very good at defeating the elements - and the breeze will blow away the fumes. Read about lighting your pipe or cigar in "Lighting Up" (March 8, 2001) and in "Liquid Fuel Lighters" (May 17, 2001). Featured is the practical, inexpensive, outdoor Imco Liquid Fuel lighter in 2 models. In the case of cigars, a major plus for the "Turbo" type lighter is its ability to combat the elements. The strong, hot flame lights the cigar very quickly. Capetonians swear by these lighters - they are almost essential. Never let the elements spoil your smoking pleasure. If it is raining just find an umbrella. The "lift off" of the embargo on Cuban cigars to the USA, that is. For many years the American premium cigar market has been dominated by the very light cigars made mainly in the Dominican Republic, many with Connecticut shade grown wrapper. Names such as Davidoff, Don Diego, Montecristo and Macanudo have been brand leaders. But tastes are changing, and probably through more and more Americans smoking the more full bodied Cuban cigars. Whether legally or not is irrelevant. The taste has taken on. Macanudo was the first brand to recognise this change when in 1998 they introduced Macanudo "Robust" in which the darkest aged Connecticut leaf is used for the wrapper. The "Robust" range was an instant success, and sales are still growing. Today Altadis is working on stronger blends for both Don Diego and Montecristo. Something more of a "Cubanesque" flavour. Don Diego will have an Ecuadorian wrapper and the Montecristo a Cameroon wrapper. It is my opinion that these changes have been made at least partially in preparation for the influx of Cuban cigars into the USA when the embargo is lifted. I feel the cigar manufacturers want to nurture this change in the taste of their consumers so that when the day comes to compete, the competition will be on quality and price, not simply on flavour. In both these areas they may win. Our next "Feature" will offer you the opportunity to taste this development and make your own judgement. We will be offering a classic light Dominican, a Macanudo Robust and a Cuban, all of approximately the same Petit Corona size. It could be an interesting experience for you. PS According to Cigar Aficionado (Dec.2000) there are signs that the richer Maduro cigars may be in vogue again. A search for "Maduro" on the Cigar Aficionado website shows 174 matches. Don Mateo Maduro Robusto is one of the few Maduros available in South Africa. On our return from a recent business trip to Cape Town we drove by way of the Pont at Malgas (still operating), and the whales at Witsand, and then turned off the N2 at Riversdale over Garcia's pass into the serene valleys of the Little Karoo en route for Oudtshoorn - through 19th Century Ladismith and Calitzdorp (with their rich architectural heritage) via the spectacular Huisrivierpas. Ladismith, laid out in 1852 and nestling in a valley at the foot of the Klein Swartberg Mountain Range, is the birthplace of C J Langenhoven (Die Stem) and of The Calabash - South Africa's unique pipe. From Oudtshoorn we took the Beaufort West road - we wanted to visit again the magnificent Meiringspoort (with Langenhoven's "Herrieklip"), 21 kilometres of winding road following the old way along the river through the Swartberge. The experience was worth even the 95 km of dirt road to Willowmore - and reaching our overnight stop at Middelburg 12 hours after we left Cape Town. The timelessness of the Little Karoo is mirrored in the cultivation and preparation of the Calabash pipe by the small group of farmers who still care. September is planting time - December the month when the fruit must be turned by hand in the heat of each day (when it is softest) to perfect the bend in the neck, carefully - too much at a time and the neck will crack. After 7 weeks those gourds that survive the wind, the plant lice and the cutworms, are harvested and the neck is cut off and boiled for 12 hours in a copper kettle. This process removes the bark and gives the pipe its beautiful honey colour. Drying is next, on racks in the sun for some days and then 3 days in the shade - too quick and the necks will crack, too slow and they will go mouldy. In some countries a fitted Meerschaum bowl is traditional for Calabash pipes. Many of our calabash gourds are exported to Europe and elsewhere especially for this purpose. The better quality bowls are made from Turkish meerschaum. The "African" meerschaum from Tanzania is less porous and less consistent. Occasionally a briar bowl is fitted. .. which hardens when moistened and allowed to dry". (Exact description from the encyclopedia.) Called Plaster of Paris because gypsum was used early near Paris, France to make plaster. It's been used since ancient times to make pottery vessels, to pre-cast and hold ornamental cornices, for sculptures and medical plaster casts amongst other things. It's easy to work with, sets quickly, has a neutral taste and will accept the temperature of burning tobacco - which makes it ideal for lining the calabash pipe, especially since we don't have any meerschaum in South Africa. We often describe it as a "clay lining" because the smoking sensation is similar to that of smoking a clay pipe. It is difficult to describe the difference between meerschaum and clay. They both taste neutral and can withstand the heat of burning tobacco. I think that the essential difference lies in the fact that the meerschaum is more porous and will hold the residue of the moisture from the tobacco (which gives it its colour) - not to mention the beauty and lightness. The pipe is finished by attaching the vulcanite mouthpiece via an individually turned wooden link. The air space left below the lining ensures a cool, dry smoke, and the juices are absorbed into the shell itself allowing it to colour as it ages to a rich brown, like old polished leather. The top of the bowl is secured with a chrome or brass ring. Each gourd is different - every pipe is individual. We divide them into full bent or half bent. and watching it as it colours - at a very special price. From October 11 to October 24 we offer the Calabash at only R175.00 instead of the normal price of R269.50. A fine "Calabash" is a joy to smoke and beauty to behold. "Those cigars - who smokes them?" Despite their quality, some cigar sizes or brands just don't sell as well as others. But they could and should be included in your personal selection, adding variety to both aspects. A Vegas Robaina Don Alejandro (Double Corona) will see you through a whole rugby test (or most of the second half of a day / night game) building in taste as the game progresses, leaving you quite satisfied (especially if we win). A Bolivar Corona Gigantes (Churchill) is nearly as big. The subtle nuances of a Cuaba Exclusivo (Perfecto) will demand more attention and could be an excellent accompaniment to a reflective 45 minutes under the stars (on holiday?). What did Fidel Castro see in those long, slim Cohibas Lanceros and Especials (Panatella) that were created for him? Smoke them slowly and gently and find out for yourself. These are some of the cigars we have on offer now at 25% off the normal Retail price. From October 25 to November 7, they will be 33% off - buy them at even better prices. So you won't have so much "quiet time" or watch so much sport in the near future? Store the cigars properly and they'll keep for ages - or share a box with some friends. The range includes cigars rated 4 and 5 stars by Theo Rudman, 84 -91 by Cigar Aficionado. Availability varies in both brand and size. Stocks are very limited so they are being kept at a central depot. They may sell out - so think of alternatives. Place your order either through head office (phone 011 4402717; fax 011 4401292; cg@wesleys.co.za) or through your nearest Wesley's. Specify from which Wesley's you would like to collect the cigars, or whether they should be posted (flat rate of R35.00 per parcel for overnight service). These extra special prices will be advertised in the shops from October 25. Following is a preview so you can decide in advance. Don't miss this opportunity to buy a 5 star cigar at a 3 star price. In an aluminium tube for long life (keep it cool). Often the better cigars are not put in tubes, but there are exceptions (eg. Montecristo), and the "No.1 de Luxe" is one. Fidel's favourite size. Sip it gently and you'll agree. One of the early shapes, recently re-introduced. 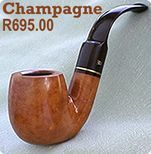 Rick Hacker describes it as "One of the all time classic shapes - a straight cigar with a reverse flare, or tapered end". A fairly narrow diameter to start with for easier lighting, widening to a broad area for a full smoke at the "best part"